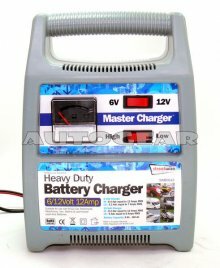 Suitable for use with 6/12V Car, Motorcycle, Motorhome, Van, Marine & Lawnmower Lead Acid Batteries. Battery capacity 9 Ah - 160 Ah. Made to European Electrical Safety Regulations EN 60335-2-29. Easy to read charge rate gauge. Includes easy to follow instruction manual. Complete with 13Amps plug & crocodile clips.